Posted Feb 05, 2018 by Eds. Such is the case with “Hostiles,” the new film directed by Scott Cooper. I’m no expert, as the saying goes. But something struck me as odd when I read reviews of Hostiles before paying my admission. My queasiness was not alleviated by seeing the film. Hostiles is a fictional story set in 1892, structured to present a diverse group of settlers, soldiers and Cheyenne Indians, compelled by circumstances to face adversity – including evil Comanche warriors – as they journey from New Mexico to Montana. Everyone is forced to learn from each other, to share their common humanity. It’s a common Hollywood theme, but one which raises far more questions than it answers. It’s not hard to find solid historical information about the Comanches. For the beginner, “Empire of the Summer Moon” by S.C. Gwynne, presents a thoughtful and deeply researched account of the life and times of Quanah Parker. One of the most charismatic Comanche leaders, Quanah survived his nation’s wars with the encroaching U.S. state, ending his days as a wealthy rancher but still a defender of his people’s rights. The story of Quanah Parker is relevant to Hostiles, for several reasons. He was the son of Cynthia Ann Parker, a girl about nine when she was kidnapped during an 1836 attack against her extended family’s ranch in Texas (which was part of Mexico until U.S. annexation). Five of her adult male relatives were killed in the raid, paying the price for their arrogance and stupidity. The Parker clan was greedy enough to establish a 25-square mile ranch deep in Comanche territory, building a fort to protect their homes and possessions from the “hostiles,” but not bright enough to realize that staking their claim miles to the west of other settlements was a problem. Topping this off, the Parkers left the gates of the fort open while the adult males with military experience worked in the fields. One spring day in 1836, an estimated 100 or more Comanche, Kiowa and other warriors rode up to the gates. Half an hour later, five men were dead, other family members were badly wounded, and five were taken away on horseback, including Cynthia. The raid received huge publicity “back East,” fuelling the racist argument that indigenous peoples were uncivilized savages. This episode was a key moment in a decades-long military resistance by Comanches against the Yankee invaders. The warriors who rode up to the gates of Parker’s Fort were not ignorant, although they could not have foreseen the invention of “weapons of mass destruction” – repeating rifles and other weapons used by the U.S. Cavalry to inflict countless massacres, and to eradicate the buffalo herds which were the basic food source for the “horse tribes” which flourished on the western plains following the Spanish invasion of the “New World”. The Comanches knew that the incoming tidal wave of settlers posed an existential threat. As a trading people with wide contacts among neighbouring tribes and nations, they knew that the Europeans brought death and destruction on a vast scale, and they had already fought the Mexicans to a standstill for a century. The type of violence seen at Parker’s Fort, and on many other occasions as the U.S. moved relentlessly onto the plains, was not uncommon during raids and conflicts between indigenous nations in and after the pre-contact period. But the perspective given by Hostiles and other Hollywood films, even those “sympathetic” to the indigenous peoples, is usually narrow and ahistorical. As Guardian reviewer Mark Kermode points out, these films focus on the “burden” of the white man forced to live with the guilt of colonialism, oppression, and genocide. Like Christian Bale’s character (U.S. Army Captain Joe Blocker) in Hostiles, they were just following orders, haunted by nightmares of Indian attacks which killed their fellow soldiers and families. Surely, according to the logic of these films, we should all just learn to understand each other and get along, putting violence behind us. 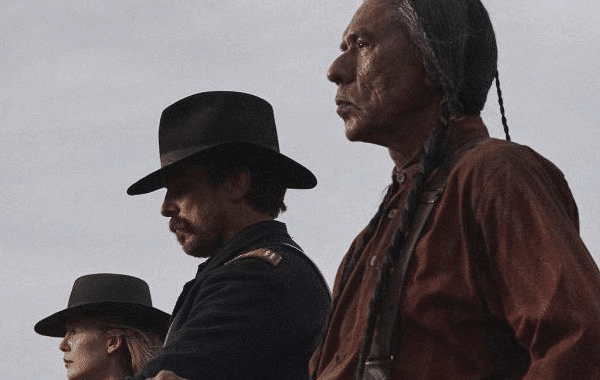 Famed indigenous actor Wes Studi plays another classic role, the stoic and wise Cheyenne Chief Yellow Hawk, being escorted back to his people’s sacred territory where he can die in peace. The undeniable talent of these and other actors in Hostiles becomes part of the problem, however. The viewer is lulled into accepting such tropes as “truth,” ignoring the wider context of history, including over a thousand years of bloody massacres and violence committed by European kings and armies. Here are just a few examples: the siege of Jerusalem, the Spanish Inquisition, the trans-Atlantic slave trade, the killing of millions of Congolese on Belgian-owned rubber plantations. To paraphrase Karl Marx wrote, capital comes into the world dripping with blood and dirt from every pore. Seen from this perspective, the events at Parker’s Fort look very different. The Comanches were simply in a better position to fight back than most others, and they did the best they could. Using their incredible horse skills and tactics, they had some success. One of their traditional strategies was to kidnap children and integrate them within their own communities. Cynthia Ann Parker grew up to marry a Comanche warrior, and gave birth to three children, before she was “rescued” in 1860 by Texas Rangers who slaughtered most of her family. Refusing to accept white society, Parker even tried to escape to return to her Comanche home, finally starving herself to death in 1871. By this time, the Comanches had been reduced from about 45,000 people down to less than 3,000. All this leads me to the question: why is Hostiles set in 1892, using the fictional story of a family massacred by Comanche warriors in New Mexico? The truth is that most of the surviving Comanches had been forced onto a reserve in Oklahoma by 1875, and their last handful of warriors had been defeated by the early 1880s. I suppose it’s not impossible that a handful may have held out until 1892 in New Mexico, the western edge of their traditional “Comancheria” territory. But more likely, the creators of Hostiles simply used legends and stereotypes deeply embedded in North American society to make a “better story”. The film is certainly dramatic and visually powerful, but it’s not “truth” in any meaningful sense. Yellow Hawk and his family are colourful but one-dimensional figures. Even worse off are the marauding Comanches, who (in Kermode’s words) are “faceless boogeymen who swoop in and kill mercilessly.” Spoiler alert: in the final plot twist, Yellow Hawk’s grandson is taken to Chicago by his new “parents,” who make no attempt to return him to his own people. Placing the blame for violence on individuals, Hostiles is, in the end, yet another apology for the crimes of imperialism, including genocide in the Americas.